It’s time to plant a very useful plant that I should have included in my Herb Book. Loofah can be planted from seed right now in full sun. Loofah is a big climbing vine related to gourds and cucumbers, and sometimes called the “dishrag vine,” a reference to the sponge-like qualities of dried fruit. The loofah is the only plant source of sponge, and it has been used in bathhouses and kitchens for centuries. Traditionally cultivated in India and the Middle East, where the name originates, loofah is also grown in other warm, dry regions. The plant looks like a cucumber. The attractive vines will take over any available surface, yielding drooping green fruit in the summer. Loofah vines are often used to cover fences or as privacy foliage, because they are dense and fast growing. The large yellow flowers are dramatic and attract beneficial insects. Loofah prefers warm, dry climates but will adapt to conditions in most of the country. It is very sensitive to frost, generally not thriving above Zone 10 except as an annual. Needs to be watered regularly, but not kept waterlogged. When allowed to mature and dry on the vine, loofah can be harvested as a sponge. The crispy woody exterior skin is peeled away, and the seeds shaken out for reseeding. Save them for planting next season. Like other sponges, loofah will collect bacteria if it is kept moist and warm, an environment common to kitchens and bathrooms. Clean your loofah sponges regularly with hydrogen peroxide. Some people use loofah in their beauty regiment as a dry exfoliating brush before bathing or grind and use it in exfoliating scrubs. 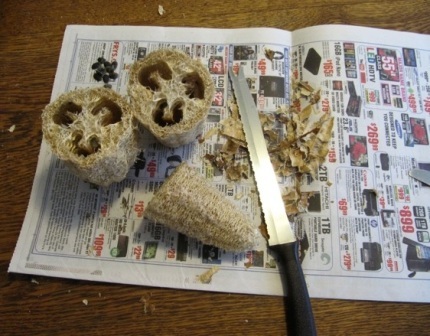 Read More on Loofah in the library of DirtDoctor.com. Please forward this newsletter if you want to everyone in your address book and all your friends on facebook and twitter. For all products I recommend shop online at NOW National Organic Warehouse.